© 2018 Lu et al. The prevalence of Type 2 Diabetes Mellitus (T2DM) continues to rise globally. The T2DM prevalence is not only in developing countries, but also in developed countries now. Correspondingly, the therapeutics of T2DM calls for a change (higher efficiency) due to growing number of patients and increasing economic burdens globally. Entering into this millennium, both piecemeal pathways (idea driven) and exponential growth of human genomic study are developing quickly. Genetypic-phenotypic translation, modern diagnostics, pharmacology, drug developments, traditional Chinese medicine, personalized medicine and so on are promising disciplines for this change. The clinical anti-diabetic therapeutics, pathogenesis, drug development pipelines are especially highlighted. In summary, a general landscape and principle of T2DM is provided. Keywords: Anti-diabetic therapy, Insulin-derivatives, Natural chemotherapeutic drugs, Diabetes-induced complication, Traditional Chinese Medicine, Diabetic pathology, Herbal medicine. The prevalence of Type 2 Diabetes Mellitus (T2DM) continues to rise globally. The T2DM prevalence is not only in developing countries, but also in developed countries now [1-4]. Correspondingly, the therapeutics of T2DM calls for a change (higher efficiency) due to growing number of patients and increasing economic burdens globally. Entering into this millennium, both piecemeal pathways (idea driven) and exponential growth of human genomic study are developing quickly. Genetypic-phenotypic translation, modern diagnostics, pharmacology, drug developments, traditional Chinese medicine, personalized medicine and so on are promising disciplines for this change. The clinical anti-diabetic therapeutics, pathogenesis, drug development pipelines are especially highlighted. In order to increase the efficiency of T2DM therapeutics, the basic knowledge of T2DM may be better understood. Fig. (1). The most frequent pathway for T2DM induction. In the long-course of T2DM induction and progress (Fig. 1), it is shown that a great number of risk-factors can totally play critical roles of disease progress. Generally speaking, it was found that many other factors (chemical, biological or environmental influence) could induce the T2DM occurrence in animal model establishment [4-6] (Table 1). A line of chemical, genetic, cellular, physiological and pathological evidence, especially genetic and environmental aspects is tabulated in Table 1. 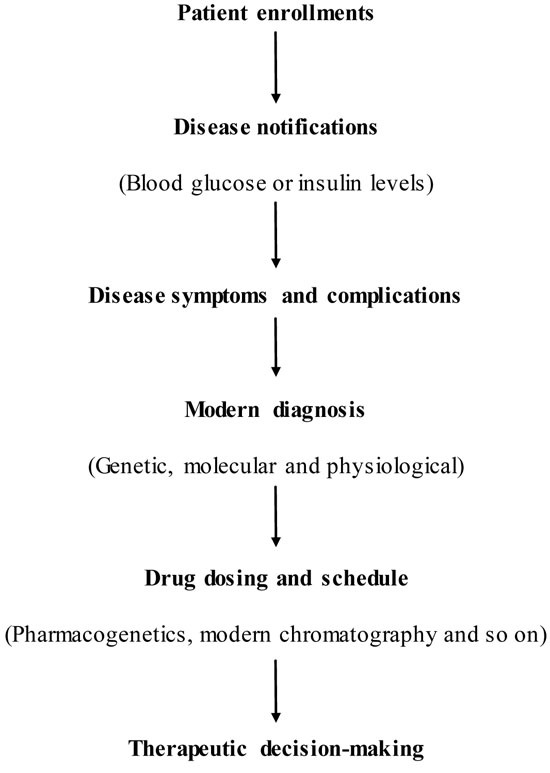 Development of Type 2 Diabetes Mellitus (T2DM) involves a lengthy and complex process from disease onset into symptom/complication manifesting in susceptible human beings. As a result, the cascade characters must be noticed at the earliest in patients. In the early stage, many preventive measures (regular exercises, non-smoking and so on) or diet control can slow down the pace of the ongoing stages. Some far-reaching medical education systems for diabetes should be introduced to human beings in order to get medical intervention as early as possible . Due to the asymptomic characteristics in early stages of metabolic syndromes, early technical diagnostics is inevitable yet imperfect now. People should be aware that high calorie food consumption is not the only factor to induce T2DM, some other unfavorable risk factors, such as habitually heavy drinking, somatic mutations, toxic compounds or sleep problems etc. [4-6]. can also trigger the incidence of T2DM. Thus, medical check-up for blood glucose concentration and levels should be carried out for people more than 40 years old every year. Table 1. Possible categories for T2DM initiations and causality. What is the therapeutic outcome and differences between patients with T2DM of various origins? What are genetic-molecular relationships between blood glucose increase and disease complications? May a known variety of T2DM origins relevant to different individuals? Can we successfully predict what kinds of diabetic-induced complications will emerge under specific conditions of patients? By taking account individual variability in genetics, environmental and life-style, might some effective medications be separately validated? What is the core of different anti-diabetic therapeutics? Can curable therapeutics be widely achieved by patients with T2DM? Without fully understanding the patho-therapeutic relation, we will not be able to retard diabetic-induced complications as early as possible. These avenues are inevitable for type 2 diabetes study. Several topics are described in this respect. T2DM is generated from genetic factors interaction with environmental influence. Personalized anti-Diabetic Therapy (PDT) may be a modern possibility that enables us to offer better therapeutics by integration of different technology and drugs. Pharmacogenetics (PG) , the widest utility of PDT has a great potentiality for drug selecting and dosing. To accomplish PG for T2DM treatments, human genetic/pathologic information must be known before therapeutics. With the advent and maturation of genomic sequencing technology , this kind of human genomic study might become practical to all patients and get information exponentially [20, 21]. But, who has the right to use human genomic information without regulation . It is an ethical question that needs long-term debates between patients and healthcare providers. Currently, the “loss-of-function” by genetic mutation, such as leptin, insulin and their receptors or down-stream molecules is widely observed . At this stage of technical capability, PG study for diabetes widely encompasses drug dosing (pharmacodynamics or pharmacokinetics issue) by genotypes of human metabolic enzymes. Due to the unpredictable nature of overall disease-related molecular alterations and metabolic abnormality, PG for various diabetic profiling is the important information different from metabolic enzymes (Fig. 2). Fig. (2) represents the outlook of PDT applications and promotion in the clinic. This type of PDT may be utilized in anti-diabetic treatments in the future [19-21]. Fig. (2). Proposed diagram of personalized anti-diabetic therapy. Neural activity and circuits that control the appetite of patients is now located onto brain hypothalamic-pituitary area . These kinds of brain activities are very important for human obesity and T2DM. Abnormal metabolic conditions in human adipose tissues; their dysfunctional characteristics are based on adipose tissues, livers and other human organs . Hormonal synthesis, secretion and resistance, such as insulin, leptin and others play key roles for patients’ obesity and diabetes [4-18]. Their synthesis, secretions and functional resistance are useful for individualized treatments of T2DM. Energy homeostasis; a lot of patients with obesity and T2DM requires food control and heightened exercise activities [15, 16]. Human energy balance will decide human body weight gain or loss and further affect blood glucose levels. This energy issue is crucial for T2DM progress and managements . Apart from these disease-induced pathways, other genetic and molecular issues may also involve [1-4]. With the growth of T2DM therapeutic study, higher efficiency of disease controls may be expected. A great variety of herbs (>500 species) have been reported to be associated with T2DM . A lot of articles reported their functionality and therapeutic activity in experimental settings. Nonetheless, only a few of these herbal drugs have been commercialized and widely utilized for T2DM prevention and treatments. Likewise, herbal therapy is one of the major avenues of diabetes mellitus therapeutic study and clinical development in the future [1, 23]. Most therapeutic data from anti-diabetic herbs are commonly based on multitude biochemical pathways, such as antioxidant activity, insulin synthesis, secretion and sensitivity, glucose uptake assistance, reduced glucose production from hepatocytes, anti-inflammatory activity and so on . However, except a small number of countries, such as China, India and Germany, herbal drugs are not allowed for therapeutic purpose worldwide because of the requisite of high-quality and complexity of drug prescription in the clinic. From pharmacological perspective, the therapeutic study for herbal medicines should aim at specific drug targets and whole body regulation in clinical trials. Many animal diabetic models might not be the best vehicle for direct translations in the clinic. To better utility of herbal drugs or recipes, some principle of TCM for diabetes might be properly established in the future . Combinations of anti-diabetic therapy of modern medicine (chemical or biological therapy) and traditional (TCM) might be useful in the clinic. Insulin-based therapy needs to improve for clinical feasibility. It commonly needs syringes and human-body injections, which lead to treatment inconvenience. Overall, some small-molecular chemicals having the insulin-configurations or insulin receptors binding activity might be potential oral anti-diabetic drugs for improving insulin-based therapy in the clinic [13, 14]. More recently, some capsules containing biological form of insulin were invented for patients needing insulin therapy . This pharmaceutical innovation can provide greater feasibility for diabetic treatments in the future. Approximately ten drugs have been widely used for T2DM worldwide. Table 2 outlines parts of these therapeutic drugs and potential applications in the clinic. Despite wide-ranges of drug developments, clinical T2DM treatments are commonly not curable [1, 23]. To most of these therapeutic options, drug treatments will be life-long for high-proportion of T2DM patients. After all, we need to know more about patho-therapeutic relations for curable therapy for patients with T2DM in the future. Table 2. The recommended therapeutic options in clinical diabetic treatments. Apart from herbal drugs, some insect products (Propolis) [25, 26] and fermented soybean (Natto) [4, 5] were also applicable in China and Japan for T2DM-related symptom control. In the past, life-style adjustment is an effective way for the reductions of blood glucose and complication events for patient’s notification [27-29]. As usual, combination of life-style adjustment and meltformin is widely recommended by both American Diabetes Association (ADA) and European Association for Study of Diabetes (EAST). Table 2 shows a great number of therapeutic options chosen for anti-diabetic treatments. Certainly, we commonly use more than one therapeutic option in clinical trials. Generally, drug combination is more welcome for refractory chronic disease, like cancer and HIV/AIDS treatments comparing with mono-therapy [30-34]. It is a new concept of whether a systematic approach could be helpful from therapeutic combination. Expanding pathological knowledge will be introduced to broader ranges of people for noticing and treating patients on disease onset. Genome Wide Association Study (GWAS) between patients and normal people may be breakthroughs for T2DM pathogenesis and treatments - the exponentially explosion of human genomic data. Genetic or molecular study of disease progression, drug pharmacology, mechanisms of action for drug activity/toxicity. Establish personalized anti-diabetic therapy in the clinic. Develop higher therapeutic-index drugs, such as natural chemotherapeutic anti-diabetic drugs [35, 36]. Pharmaceutically improves insulin-based treatments from needle to oral. Budget control in drug developments and cost-effective in clinical treatment selections will be more optimized . Global cooperation is inevitable, especially invitation of mathematical majored students and scholar in this medical campaign [38-40]. Mathematical solution of disease risks and occurrence is given in Equation 1 . Despite a lot of discoveries, current therapeutic agents (such as insulin and other drugs) are economic burden to patients due to long-term of drug utility (generally >400 USD per year). Rapid development of higher efficiency anti-diabetic drugs, especially for diabetic-induced complications, is a high priority and of great medical significance [42-46]. A step closer should be a marvelous thing. Given too much molecular components and pathways can be involved in T2DM origins, growing volumes of financial supports must be allocated in both developing countries and developed countries. To sum up, win-win situation between developed countries and developed countries can decide how long we can go through in this medical campaign. After global cooperation, both extremes of human populations can be provided with high quality of anti-diabetic medications. In the future, new perspectives and scientific investigations will be introduced for changing the landscape of current anti-diabetic therapeutics if possible. A lot of therapeutic options need to be better served for complicated situations of diabetes in the clinic. No Animals/Humans were used for studies that are bases of this research. This work was funded by Shanghai Science and Technology Foundation of High Educations 97A49. Lu DY, Che JY, Yarla NS, et al. Types 2 diabetes prevention, treatments and new drug developments. Clin Immunol Endocr Metab Drugs 2018; 5. Kaul K, Tarr JA, Ahmad SI, Kohner EM, Chibber R. Introduction to diabetes Mellitus. Diabetes: An Old Disease, A New Insights. In: Ahmad S, Ed. 2013; 1-11. Zimmet PZ, Magliano DJ, Herman WH, Shaw JE. Diabetes: A 21st century challenge. Lancet Diabetes Endocrinol 2014; 2(1): 56-64. Ahmad S, Ed. An Old Disease, A New Insights 2013. Lu DY, Che JY, Yarla NS, et al. Diabetes prevention and treatments, a specific topic for modern medicines. J Metab Syndr 2017; 8(3): 231. Lu DY, Che JY, Yarla NS, et al. Type 2 diabetes, medical knowledge and pharmaceutical innovations. J Diabetol 2017; 1(1): 1-3. Yang W, Lu J, Weng J, et al. Prevalence of diabetes among men and women in China. N Engl J Med 2010; 362(12): 1090-101. Fuchs S, Henschke C, Blümel M, Busse R. Disease management programs for type 2 diabetes in Germany: A systematic literature review evaluating effectiveness. Dtsch Arztebl Int 2014; 111(26): 453-63. Putta S, Peluso I, Yarla NS, et al. Diabetes mellitus and male aging, pharmacotherapeutics and clinical implications. Curr Pharm Des 2017; 23(41): 6321-46. Singh A, Srivastav R, Randey AK. Protective role of Terminalia Chebula in streptozotocin-induced diabetic mice for wound healing activity. Br J Med Med Res 2017; 22(2): 1-8. Nannapaneni S, Ramar K, Surani S. Effect of obstructive sleep apnea on type 2 diabetes mellitus: A comprehensive literature review. World J Diabetes 2013; 4(6): 238-44. Freire MDM, Alves C. Therapeutic Chinese exercises (Qigong) in the treatment of type 2 diabetes mellitus: A systematic review. Diabetes Metab Syndr 2013; 7(1): 56-9. Lu DY, Che JY, Wu HY, Lu TR. The pathogenesis and treatments of diabetes, questions and answers. Cell Dev Biol 2014; 3(3): e126. Lu DY, Che JY, Wu HY, Lu TR. The pathogenesis and treatments of diabetes, a new insight. Adv Tech Biol Med 2014; 2: e102. Lu DY, Che JY, Wu HY, et al. An overview of obesity. Metabolomics 2018; 8(2): 200. Lu DY, Che JY, Wu HY, et al. Obesity, risks and managements. Metabolomics 2018; 8(1): e156. Steculorum SM, Paeger L, Bremser S, et al. Hypothalamic UDP increases in obesity and promotes feeding via P2Y6-dependent activation of AgRP neurons. Cell 2015; 162(6): 1404-17. Lee YS, Kim JW, Osborne O, et al. 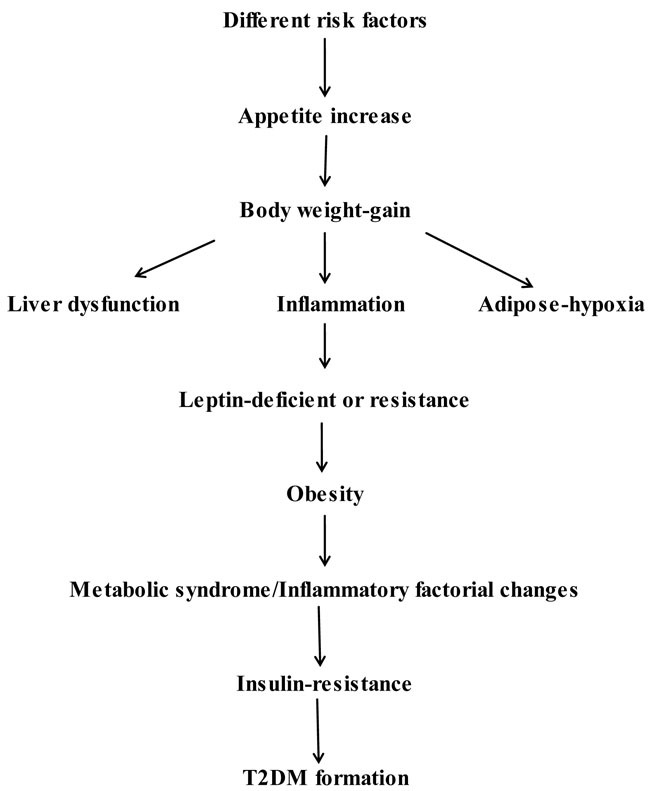 Increased adipocyte O2 consumption triggers HIF-1α, causing inflammation and insulin resistance in obesity. Cell 2014; 157(6): 1339-52. Corrêa-Giannella ML, Machado UF. SLC2A4gene: A promising target for pharmacogenomics of insulin resistance. Pharmacogenomics 2013; 14(8): 847-50. Lander ES. Initial impact of the sequencing of the human genome. Nature 2011; 470(7333): 187-97.
 van der Klaauw AA, Farooqi IS. The hunger genes: Pathways to obesity. Cell 2015; 161(1): 119-32. Rahimzadeh V, Bartlett G. Policies and practices of data-intensive primary care in the precision-medicine era. Intern Med Rev 2017; 3(9): 1-14. Li GQ, Kam A, Wong KH, et al. Herbal medicines for the management of diabetes. An old disease, A new insights. In: Ahmad S, Ed. 2013; 396-413. Imam K. Management and treatment of diabetes mellitus. An old disease, A new insights. In: Ahmad S, Ed. 2013; 356-80. Lu DY, Che JY. Rethink of diabetes treatment and drug development. Cell Dev Biol 2014; 3(2): e125. Wagh VD. Propolis: A wonder bees product and its pharmacological potentials. Adv Pharmacol Sci 2013; 2013: 308249. Thepwongsa I, Kirby C, Schattner P, Shaw J, Piterman L. Type 2 diabetes continuing medical education for general practitioners: What works? A systematic review. Diabet Med 2014; 31(12): 1488-97. Grimaccia F, Kanavos P. Cost, outcomes, treatment pathways and challenges for diabetes care in Italy. Global Health 2014; 10(1): 58. Wens J, Vermeire E, Hearnshaw H, Lindenmeyer A, Biot Y, Van Royen P. Educational interventions aiming at improving adherence to treatment recommendations in type 2 diabetes: A sub-analysis of a systematic review of randomised controlled trials. Diabetes Res Clin Pract 2008; 79(3): 377-88. Lu DY, Lu TR, Cao S. Drug combinations in cancer treatment. Clin Exp Pharmacol 2013; 3: 134. Lu DY, Chen EH, Lu TR, Ding J. Anticancer drug combinations, studies from different pathways. Cell Dev Biol 2015; 4(5): 166. Lu DY, Wu HY, Yarla NS, Xu B, Ding J, Lu TR. HAART in HIV/AIDS treatments, future trends. Infect Disord Drug Targets 2018; 18(1): 15-22. Lu DY, Chen EH, Wu HY, Lu TR, Xu B, Ding J. Anticancer drug combination, how far we can go through? Anticancer Agents Med Chem 2017; 17(1): 21-8. Lu DY, Lu TR, Yarla NS, et al. Drug combination in clinical cancer treatment. Rev Recent Clin Trials 2017; 12(3): 202-11. Lu DY, Lu TR, Lu Y, Sastry N, Wu HY. Discover natural chemical drugs in modern medicines. Metabolomics 2016; 6(3): 181. Alam F, Islam MA, Kamal MA, Gan SH. Updates on managing type 2 diabetes mellitus with natural products. Towards antidiabetic drug developments. Curr Med Chem 2016; 23(29): 1-37. Asche C, LaFleur J, Conner C. A review of diabetes treatment adherence and the association with clinical and economic outcomes. Clin Ther 2011; 33(1): 74-109. Lu DY, Lu TR, Lu Y, Wu HY, Yarla NS. The acquisition of mathematical language in biomedical articles. J Cell Developmental Biol 2017; 1(1): 8. Lu DY, Lu TR. Mathematics or physics-majored students on the biomedical fields, insiders or outsiders? Metabolomics 2015; 5(4): e142. Lu DY, Wu HY, Lu TR, Che JY, Lu Y. Updating biomedical studies by recruiting more mathematics or physics-majored talents. Metabolomics 2016; 6(2): e148. Gentle JE. Elements of Computational Statistics 2002. Turpin SM, Hoy AJ, Brown RD, et al. Adipose triacylglycerol lipase is a major regulator of hepatic lipid metabolism but not insulin sensitivity in mice. Diabetologia 2011; 54(1): 146-56. Putta S, Yarla NS, Peluso I, et al. Anthocyanins: Possible role as multitarget therapeutic agents for prevention and therapy of chronic diseases. Curr Pharm Des 2017; 23(30): 4475-83. Davis TME, Ting R, Best JD, et al. Effects of fenofibrate on renal function in patients with type 2 diabetes mellitus: The fenofibrate intervention and event lowering in diabetes (FIELD) study. Diabetologia 2011; 54(2): 280-90. Metabolex Inc. Use of (-) (3-trihalomethylphenoxy)(4-halophenyl) acetic acid derivatives for treatment of type 2 diabetes. US8329749 (2012). Metabolex Inc. N-linked heterocyclic receptor agonists for the treatment of diabetes and metabolic disorders. US20120322804A1 (2012).